King Darkforge can be crafted in the Alchemy Workshop. What about the force that is both unstoppable and immovable? Affected units are granted 85% increased damage, 50% damage reduction and debuff immunity. However, at the cost of 30% speed reduction and being unable to receive healing. Lasts 5 seconds. Buildings sink into the earth, replaced by a dwarf with a sharp grin and a sharper axe. Deals 25 damage in an area and summons x3 Kings Guard(Level 1). Damage is doubled against walls (50). Fire bursts from the earth dealing 25 damage immediately and 75 damage over 10 seconds. 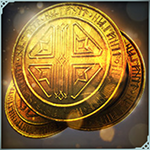 Gold Smelter and Gold Storage buildings caught by this ability take double damage and will reward an additional 1 Mana on destruction. Consume to increase the rarity of King Darkforge. Increased by one step up to a maximum of Mythic. Like many of his kind before him, Basalt Darkforge loved gold. As a lowly miner he’d learnt how to detect seams and retrieve the precious metal without causing cave-ins. When he became head foreman he developed pioneering techniques to maximise productivity and ore production. And after he rose to become King, Basalt opened new mines and forges across all the neighbouring lands.